Welcome to those of you joining me from A World View and those of you just hopping aboard. I am the 3rd stop on our Magical Blogorail. While at first glance, it wouldn't seem like Epcot is a very kid-friendly park, there are hidden treasures your children will adore. In World Showcase, the Cast Members alone can be a hidden treasure. More than someone to just ring up your t-shirt or prepare your snack, these young people are a wealth of knowledge. Consider having older children ask a certain question of a Cast Member (CM) in each pavilion. Is your child a little foodie, sports fan or movie buff? Have them ask CMs about their favorite foods, sports or films from their home countries. My children are too young for this yet, but I had a CM from each World Showcase country sign a first birthday card for Tink. It was lots of fun for us and I hope it's special to her later. Be sure to check the entertainment schedule and watch a few of the performers at Epcot. The Jammitors are a fun percussion group who drum on buckets and trashcans while telling silly jokes. They appear multiple times near Innoventions East and West. In France, the kids will enjoy the acrobats, as long as they don't get any ideas about stacking all of your kitchen chairs. The World Showcase Players is another terrific act, performing on the streets in the United Kingdom Pavilion. This troupe recreates stories loosely based on famous tales. There is lots of audience participation so stand up front and jump right in. Candy, candy, candy. What child doesn't love the stuff? Let your child buy a bit of candy in each World Showcase pavilion to see what kids in other parts of the world enjoy as a treat. Don't underestimate the entertainment value of simply running and being a kid. The hedge maze in the back of the UK pavilion is a wonderful place for children to burn off a little energy and it's tucked out of the way. If the weather is nice, consider letting the little ones play in one of the splash pads or cooling stations. Just pack a change of clothes and let them get wet. In Mission Space, there is a small playground area perfect for some wiggle time while the big kids take in the E-Ticket attractions. If you time it right, there is a special hidden treasure at Epcot for parents. Be sure to have a stroller for this one. Epcot is a huge park and will tire little legs. If you can get them to sleep in the stroller, Mom and Dad can enjoy one of the many unique adult beverages available at Epcot and walk together along the promenade. It's a way to sneak in a mini-date, even if one of you does have to push the kiddos. Thank you for joining me today. Your next stop on the Magical Blogorail Loop is Focused on the Magic. 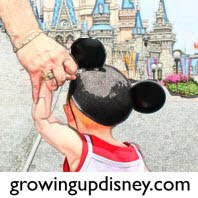 This article originally appeared on Growing Up Disney on 9/16/11. Great suggestions! I love interacting with the CM's. Haha loved those mini dates when my kids were young:) Terrific ideas and I agree CMs are a hidden treasure! Love the idea of the candy from each nation. This would provide a great memory after the trip. Need to remember this the next vacation. Thanks. Love the idea of the birthday card! We haven't taken Noah to the hedge maze - honestly, the smell of fish in the UK usually sends us quickly onto the next pavilion, but I think we'll have to try that in January.. so far, his favorite is the train station in Germany! Great tips for bringing kids to Epcot - we will have to try out the candy from each country!